Bookcases usually end up in a few rooms of the house, and most times just end up collecting stacks of books and other things that don't really belong there and, had you taken a little bit of time, could be the focal point of the room, or allow you to tell the story of why you call your house a home. I love this transitional bookcase in this space, you can find it here. 1) First, I usually always end up painting a pretty accent color to the back of book cases. 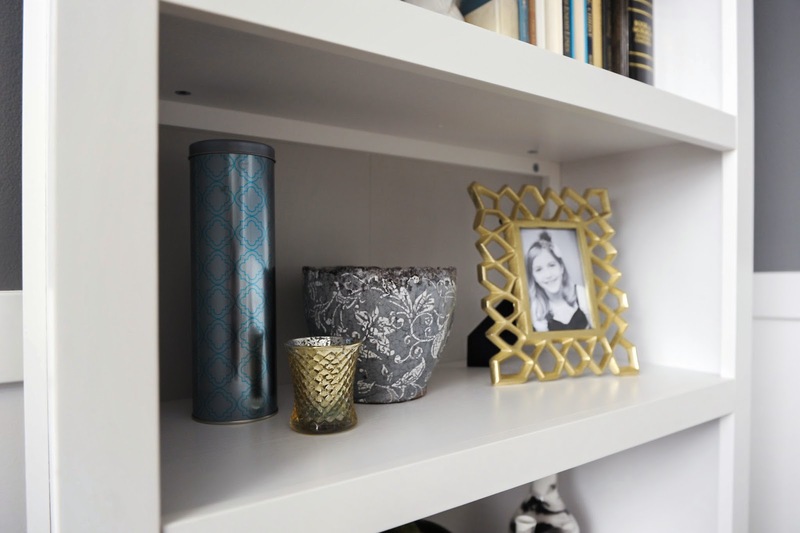 Using a fun color to pop, a nice patterned wallpaper or stencil, or just a nice contrasting color works great and will give the bookcase depth and interest. In this case I chose a subtle gray color that was lighter than the dark charcoal walls. It gives a tiny bit of dimension and is a perfect back drop for the beautiful decorative pieces. 2) Pick a color scheme you want displayed. Usually you are good with going with 3 or 4 different subtle colors so the space doesn't look too busy. In this case I picked metallics, b&w, and for the 'pop' a soft turquoise color. 3) Next collect all the decorative items in your house you are not using. More times than not you have a handful of great pieces that will just need a new piece to make it pop, like a candle stick could just use a more updated candle topper, you could spray paint an old frame, or a vase could just use some new silk flowers from the hobby store. 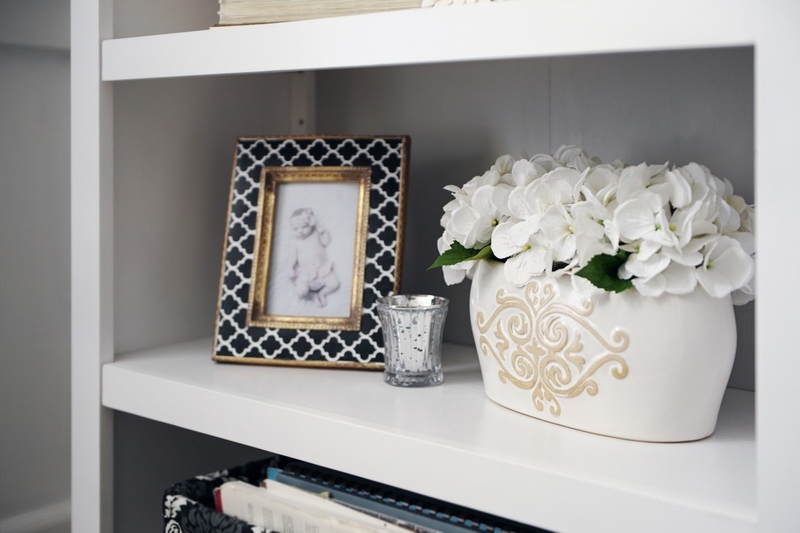 In this clients case we only used a handful of things she already had, so I had a budget and I went to a few of my favorite discount home stores. I got most of these items at Walmart, TJmaxx, Homegoods, Target and DI. (our local goodwill) No need to spend a lot on these items, just that they are visually interesting and will stand out and make an impact. Think height, shape, what colors will pop against the bookcase. I don't decide how to place things until after I have a bunch of items to use. Sometime you will end up returning things not used, but I say its always better to be safe and have more to work with. 4) When it comes to the books I display I usually go around the house and see all of the books there are to work with. I keep the ones that have a pretty spine, and a good colored spine. I always take the book sleeves off and I like to stack them as seen here, and put them upright on one side of the shelf. I usually always flip at least one or two around to give visual interest. And I try to not have the same colored spine right on top of the same color. Mix them up to give interest. Also, I love laying them on top of each other on one shelf then on another shelf stacking them side by side. And for those who ask... "why don't you display MORE books here?" Here is your answer. Most of my clients do have additional spaces to house their books they read often, (office or library) or don't really want to display all of their books in their living spaces. To be honest, more times than not I buy the displayed books at 2nd hand shops and just search for the right scale, colors and bindings. 5) When you have all of the items lay them out in groups. So all of the frames together, all of the vases together, etc, etc... It is best to see in plain site what items you have to work with. When displaying the items I usually take some time. I place items in two's then the next shelf three's and back to two's, and I make sure whatever item is above and below on the shelf isn't right above or below the other. 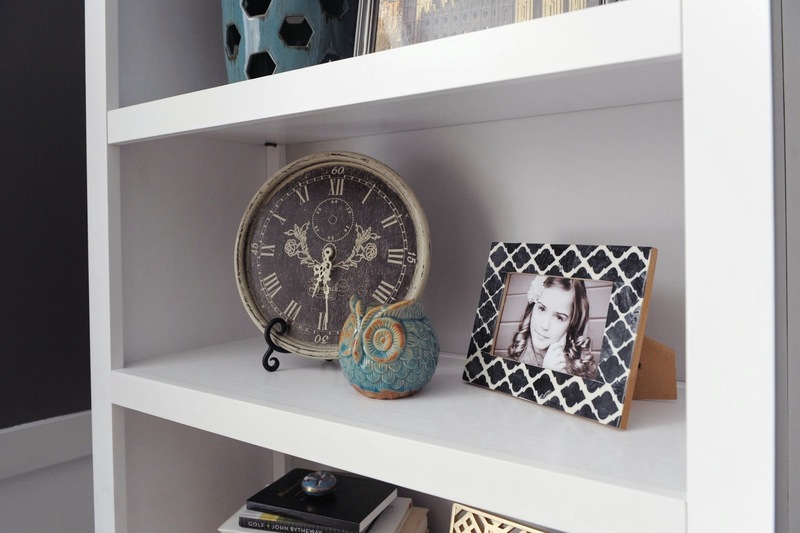 (ie... don't have a vertical row of picture frames or books) try staggering items, shapes and colors from one side to the other... And the shelf could have 6 items on it, the key is to group them to give the look of say two picture frames as one item. 7) DIY saves money, and gets you the desired result! 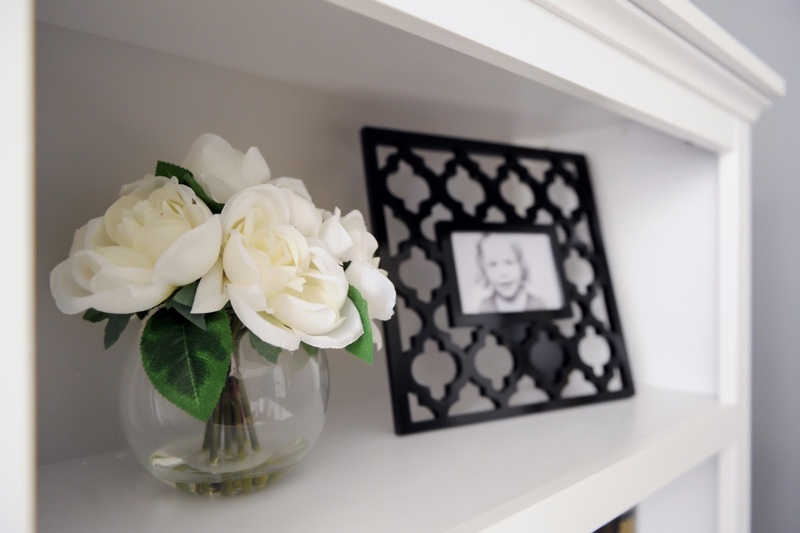 For example, don't forget that you can make your own flower arrangements to save money, and most importantly, fit the space. I made the one below here with a low potted vase, and the right size flowers I wanted. This came to only $10 at Walmart! 8) Don't fret if you have to take a gazillion steps back and make sure the items are balanced on the book cases, and my secret to knowing if it really looks good is taking pictures. I take pictures with almost every part of staging a room. Bookcases are a must. Lots and lots of pictures from different angles! That way it will save you from thinking you are done, then seeing it in a different angle and having to move something. Where are these bookcases from? Looks great! I agree!! Where did you find these?? I've looked everywhere for solid white bookcases like that! Very few books to cal it a bookcase. Our books fill most of the shelves. I agree with Sandrahemming. It looks lovely, but where did all the books go? Funny you both say that. :) I actually ended up buying all of these books for this client. She has a few other book cases in her home and this room is the first impression of the house. So she kept the old dusty books in the other ones. With kindles now a days I see less and less of books in homes I design. It may be surprising to you how many times I have had to buy books to stage book cases! Thanks for your comments! Heavier items belong on the bottom; lighter as you rise up the bookcase. 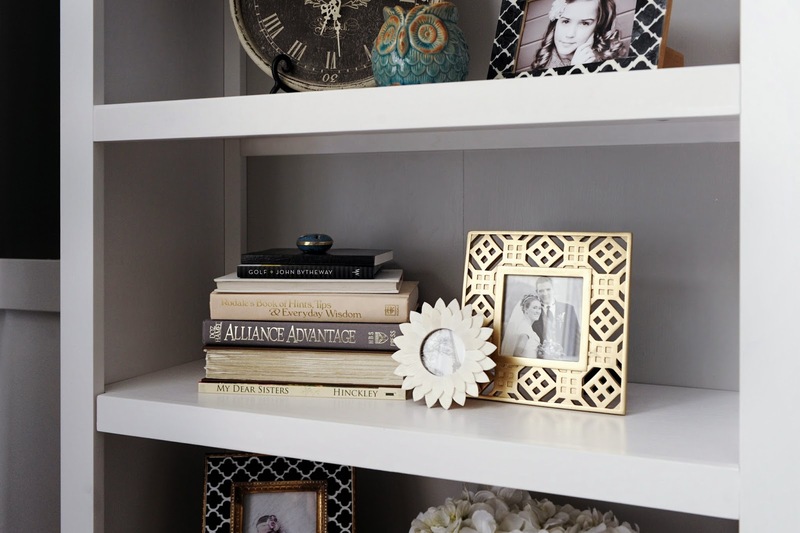 Arrange items to make the eye zig zag up the bookcase. Like the rules for landscaping, I like to group using odd numbers. How would you arrange items collected from various trips when they aren't common colors, etc.? This is a great question! I will create a blog post just for you! Thanks for the great question! Like others, we have mostly books. A few other items. Most homes do not have enough space for separate cases for decor & books. (btw: Husband has dejunked, taken others to the office, and given some away, but we have lovely 9 ft. long 5 ft. high bookshelf that's still full of classic books & he has a kindle). How would you display a case full of books w/very little space for other objects? I think staging a room is only done when you are selling your home. Right? what is the paint color on the wall? You can also get a very similar bookcase at Ikea. 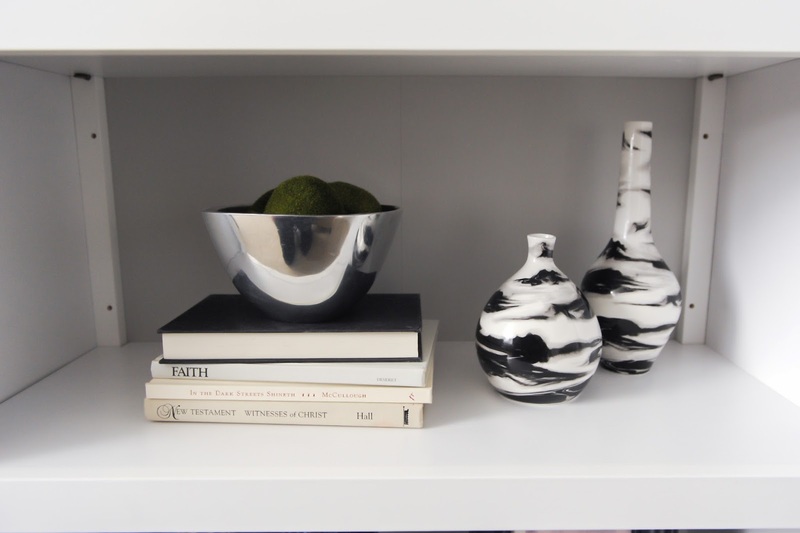 You have given some pretty useful tips on staging a book case. i have a pinterest board full of book case projects and now Im ready to work some magic on my own. We have a ton of books but I really need things to look ordered and pretty. My solutiin was to cover all my books white and handwrite titles on them. Pretty and functional. Took awhile but worth it! I love the black basket and all black picture frame, where are they from? I've got one myself since like 10 decades. I like it as well, not modded as yours however. At this time it does not operate, it hastens if warm. Brought into a neigbour of mine and he will get a deeper look at it. It seems as though a few have had difficulty with the automatic decompression valve, so does yours have this? Very nice! Thanks for sharing it with us. If you are looking for virtual home decorating,then you can get it done from whynothomes.